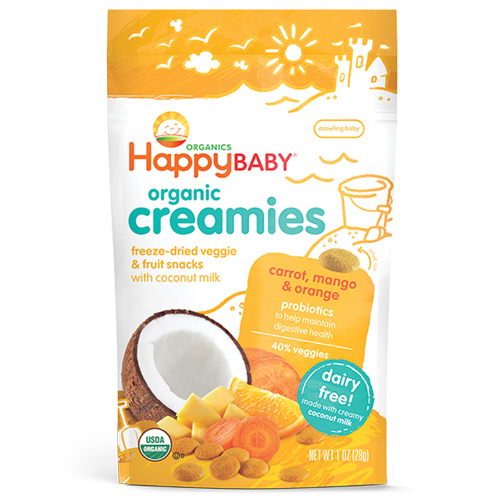 Our Happy Creamies are a delicious, non-dairy snack for babies & toddlers. Made with organic fruits, veggies, and coconut milk, this yummy snack is a great way to get veggies in your little one on-the-go. Carrot, Mango, and Orange Happy Creamies are a non-dairy, melt-in-your-mouth treat made with nutritious veggies and yummy coconut milk. They help to teach baby self-feeding while developing a palate that craves vegetables. Reseal after use, for maximum freshness use within 7 days. This product should only be fed to seated, supervised children who are accustomed to chewing solids foods. Launched on Mother’s Day 2006, and founded and operated by moms, Happy Family is a leading premium organic food brand delivering optimal nutrition for the entire family. In 2011, founder and CEO Shazi Visram earned the title of Ernst & Young’s Entrepreneur of the Year for New York. Happy Family has been named as one of the fastest growing organic food companies in the nation by Inc. magazine for two years running, and was named “Rockstar of the New Economy” by Fast Company in 2012. When you feed your child Happy Family products, every bite really counts. Happy Family works with pediatricians and nutritionists to develop the recipes, starting with the very best organic fruits, vegetables, dairy, meats and grains. Today, Happy Family provides organic foods for babies, toddlers, kids, and even adults! It’s delicious, convenient and made with a mother’s touch for all ages, all stages. What could be happier than that?